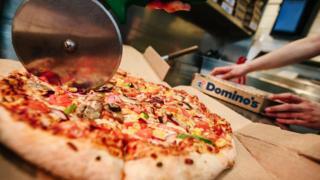 Domino's Pizza has rejected claims it has been misleading investors over relations with some of the franchisees who own its outlets. Some of the owners who run the chain's 1,100 stores have been fighting the company for a greater share of profit. According to the Sunday Times, the Domino's Franchise Association (DFA), accused Domino's of misinforming the City by suggesting last week the wrangle could be resolved. Domino's "strongly refutes" the claims. The DFA, as reported in the most recent Sunday Times, said they were at total odds with the company and that therefore any comments suggesting a resolution was near were misleading. On Monday Domino's said it "notes the press article in the Sunday Times... referring to confidential correspondence" and it "strongly refutes the reported allegations". It goes on to say it "has been clear and transparent that it has been in commercial discussions with franchisees, which are continuing". In its results released last week, which showed sales up but profits down, it acknowledged that relations with franchisees would hold back the number of new store openings this year. It said the "2019 UK store pipeline similar to 2018 at the same time last year, although actual openings likely to be lower than 2018, given ongoing franchisee discussions". That statement also said discussions with franchisees had intensified, but "we are confident that we will resolve our differences to the benefit of customers". Last year, 11 of the company's biggest franchisees wrote to the board threatening to "declare war" on the firm unless they got a bigger slice of the company's profits. They warned then they could stop opening new outlets if their demands were not met.